Whether in real or fictional trials, witness evidence often captures the popular imagination. It is exciting to pit the advocate’s art against the professed recollections of the witness. Usually it is the fearless defence lawyer in a murder trial who bores away until the truth emerges from the witness’ false recollections and evasions. Yet, witness evidence is as important to international commercial disputes as to domestic criminal trials. Every commercial dispute is the tale of a difficult business relationship or, at worst, a deal gone wrong. Every good story has its cast of characters. In legal disputes, they appear as witnesses. In a smaller case, the dispute may concern an accounting dispute over the calculation of an interim payment or the precise requirements for a consignment of goods. In a major case, the parties will look back on years of commercial failure, broken promises and false hopes: a newly acquired company or joint venture that never turned a profit, a new airport terminal unsatisfactorily completed after years of delay, an oil concession obtained through bribery or allegations of misappropriated proprietary information, among others. As these examples suggest, most international commercial disputes involve complex facts. For example, accounting principles for the valuation of a company, technical specifications in a construction project or scientific data needed for a patent dispute. Even so, the evidence of witnesses adds colour to the proceedings and often determines the outcome. It is important for any court or tribunal to hear from the people directly involved, to understand what they saw and did, and to get a feel for their concerns and aims. In addition to fact witnesses who provide factual information – who said what, when and to whom – there are expert witnesses. Experts come in after the event and give opinions on particularly complex issues, usually financial or technical, based on their analysis. They may say, for example, whether, on their understanding, a company suffered a loss or whether a party acted reasonably in making a management decision. It is easy to agree that any adjudicator or decision maker, in the widest sense, may be helped by the evidence of witnesses. Yet, there are disagreements as to the best way to gather and present it. 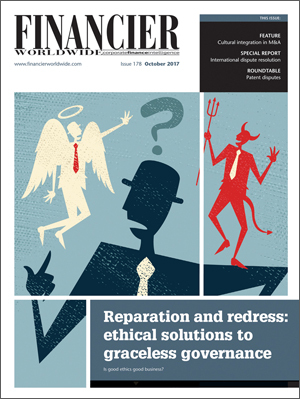 While witness evidence is widely accepted as an integral part of international dispute resolution, legal cultures differ in their perception of its value. In very rough terms, common law countries, such as England, Australia and the US, attach more value to it than those in the civil law tradition, such as the jurisdictions of continental Europe. Moreover, the attitudes of witnesses themselves reflect their different cultures. At the very least, many find themselves forced to give evidence in a foreign language. The differences of legal culture come to the fore particularly in international commercial arbitration. In simple terms, arbitration is a form of privatised litigation. Instead of referring disputes to the courts of one or other jurisdiction, parties agree to refer them to an arbitral tribunal appointed uniquely to resolve whatever dispute the parties refer. Typically the tribunal will comprise one or three arbitrators, usually senior lawyers, and the parties will have some say in their appointment. The arbitrators’ decision is binding and can be enforced in the great majority of countries under the New York Convention of 1958. The parties can thus appoint a neutral tribunal, tailor-made for their disputes. Often, arbitration is the only viable choice. Parties from two different countries doing business in a third country will often not want to submit disputes to the courts of each other’s jurisdiction. They may also have misgivings about the local courts in the place of their business, perhaps because the legal system is not seen to be impartial or commercially sophisticated. Parties and lawyers the world over conduct arbitrations, so arbitral practice brings out the differences between business and legal cultures. The procedure is often less rigid than in a domestic court and can be adapted to the needs of a given case. In practice, it draws on various domestic court procedures, which it distils into an international practice palatable to different legal cultures. Some of the practices regarding witness evidence are set out in the IBA Rules on the Taking of Evidence in International Arbitration. This so-called soft law instrument is often used by arbitrators and counsel as a source of guidance in setting procedures and making decisions. The witness may seem lonely and exposed on the stand but one of the controversies in international practice is the control that parties exercise over their witnesses. Parties are usually free to call as witnesses anyone who can help their cause. This may include company officers, such as the CFO in an accounting dispute, employees, former employees and professional advisers. For practical reasons, it pays to call witnesses sympathetic to the cause. An unwilling witness, such as a disgruntled former employee, is usually a bad witness, even if entirely truthful, because he (or she) will resent taking the time to testify. A witness too sympathetic to the cause will also pose problems. Arbitrators are sophisticated lawyers rather than lay jurors and some of them will have attended hundreds of hearings. They will want relevant answers on relevant issues. Finally, for cultural reasons witnesses may differ greatly. Some will relish the opportunity to tell their version of events, while others will be reluctant to comment on their employer’s actions. Because the parties, their counsel and the arbitrators are often based in different parts of the world, hearings tend to be quite short for practical reasons, often a few days and rarely more than two weeks. This limits time for hearing witness evidence. To save hearing time and enable the arbitrators to prepare better for hearings, witnesses submit written evidence in a signed witness statement. This is different from depositions in US litigation or the oral evidence in English criminal trials. It is normal and acceptable for lawyers to help witnesses prepare their written evidence and the help is acknowledged in the statements themselves. How much help the witness receives will vary depending on the witness, the case and sometimes the language of the arbitration. Heavily ‘lawyered’ witness statements can pose problems. It is not always clear to an arbitral tribunal whether the lawyers led the witness to testify in one way, perhaps by putting carefully prepared questions to the witness or highlighting certain aspects of their case. Ultimately, the witness not the lawyer testifies. Any witness who cannot express even simple ideas on the stand having filed a sophisticated statement is a serious embarrassment. In the US particularly, there is a strong tradition of preparing witnesses to testify. This goes beyond the practice in England and certainly beyond practice in continental Europe. To some degree the preparation is regulated by rules of professional conduct, to some degree it is also reflects the style of questioning at the hearing. Aggressive US style cross-examination may require the witness to be better prepared than gentler questioning in continental Europe, where the judge has a more inquisitorial role in questioning witnesses. More philosophically, there is the question of how to ensure the best quality evidence. To a US lawyer, a witness’ evidence may be strong because he studied documentary evidence before the hearing, refined his possible answers and understood the issues at stake. To a European lawyer, a witness’ evidence may be weaker for having done just those things, whereas an unprepared witness is seen to give straightforward, unprejudiced testimony. Many cases involve highly technical matters, at least in the damages phase. The loss suffered by a company is not easily assessed without the help of an accountant, and arbitrators are glad of that help. The expert’s role is to assist the arbitral tribunal by presenting an analysis of evidence that the arbitrators could not understand by themselves. The expert’s overriding obligation is to the arbitral tribunal. There has been some debate whether each party should appoint its own expert on, for example, damages, or whether the arbitral tribunal should appoint a single expert. In practice, the former view has won out. Party-appointed experts are sometimes dismissed as ‘hired guns’, but the best of them will not want to risk their credibility by defending far-fetched positions. Moreover, it is often useful to an arbitral tribunal to have two different but complementary points of view on the same complex issue. Finally, good expert witnesses help the parties that appointed them by enabling the parties to better understand the strengths and weaknesses of their position. To return to the imaginary witness examination at the opening of this article, the challenges of testing and evaluating witness evidence are not only affected by the limitations of the human memory and sometimes candour, but also by the governing procedures and the preparation of the witness. It would be too easy to reject witness evidence as flawed and manipulated by lawyers. The better approach is to understand how it was compiled and to challenge and judge it on that basis. The conventions surrounding witness evidence in arbitration allow the parties and tribunals to benefit from witness evidence, as well as allowing them to reflect on and follow international best practice. Daniel Greineder is a partner at Peter & Partners. He can be contacted on +41 58 317 70 70 or by email: dgreineder@peterandpartners.com.